En Suite Bathroom Cost 2018: How Much Does An En-Suite Cost? A new en-suite bathroom can look great and add value to your property – but how much is the extension going to set you back? Are you sick and tired of getting up in the middle of the night and wandering about the landing to go to the toilet? Or exhausted with sharing a single bathroom with an increasing number of family members? Then – if you have the room – why not think about having an en-suite bathroom installed in the master bedroom of your property? Not only do these extra rooms give you some much needed space and privacy in the confines of your own bedroom, but they also provide constant access to additional bathroom facilities and make it easier for everyone to get up and out the house as soon as they need! Plus an en-suite can even be installed so it connects to more than one room should you so wish! So what sort of things do you need to think about when planning a new en-suite bathroom for your home and how much does an ensuite cost? Offer additional privacy away from the more public family bathroom. Are more conveniently placed for you to use on a regular basis, especially if you are prone to getting up in the middle of the night. Can help to save you and your family time in general; an additional bathroom means the time it takes getting ready to leave the house can be almost halved in an instant. Come in a range of different styles and designs – whether you want a pre-arranged model or bespoke service, there is something in the en-suite market for everyone and any kind of home interior. Can be fitted into surprisingly small spaces, making them suitable for all sorts of property types – from terraced housing to larger semi-detached or detached properties. Can be adorned with a range of modern fixtures and fittings, from heated towel rails to neon LED spotlights – anything to make you more feel more at home. Can add significant value to the property should you decide to move on and sell – making them a more than worthwhile home improvement project! To find the best deals and widest range of potential en-suite bathrooms for your property, you should get in touch with a range of different plumbers and/or interior design contractors; this will allow you to find an individual you can work with and liaise with properly, helping to prevent any major hiccups during the construction phase of the project. A pre-designed model is usually a lot cheaper than a bespoke service, but by shopping about for a good price you might even be able to find someone who can tailor the bathroom to your personal tastes and specification – it all depends on how much effort you are willing to put into finding a contractor that is right for you! 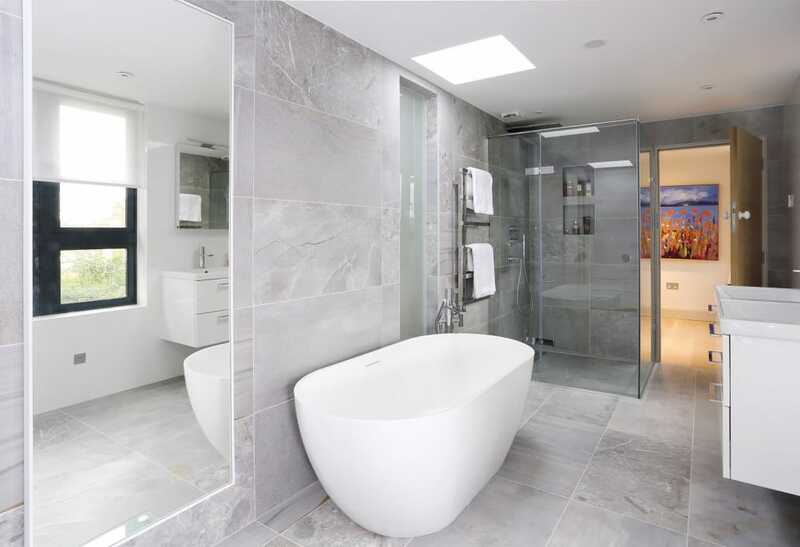 How big should en-suite bathroom be? En suite baths are usually small, so you need to have a well planned layout and also try to keep it as simple as possible. Ideally, the dimensions should be around 1,50cm X 1,30 cm but even with less space you can have one built for you, if you stick to the essential elements such as a shower, a basin, a mirror, a towel rail and flush toilet. If there is a lack of space and you need your ensuite look bigger, choose sanitary ware designed to save space such as corner shower, corner basin or even a toilet with integrated sink. However, do not go too small when it comes to your shower, as anything smaller than 80cm quadrant, you will not feel very comfortable when showering. Furthermore, either pitch your shower at the highest point or simply install a hand shower instead. 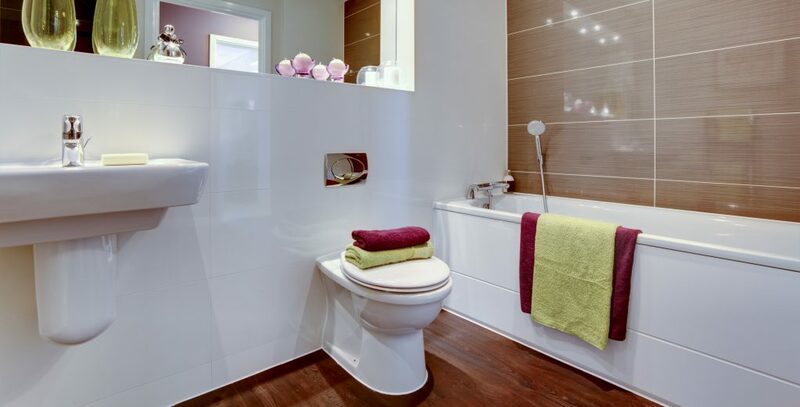 As ensuites are usually small, in order to make them look bigger you will need to use every possible trick. To maximise light, cover your walls with solid mirrors and also try to focus on the brightest parts of the room by incorporating either bright or pale coloured tiles in the overall design. A fully enclosed wet room, usually provides ample space for a generous showering experience and also allows enough space to place the towels and the toilet roll, so that they do not get drenched while you are washing your hair. Consider also using a heated mirror and installing underfloor heating if the wet-room is more steamy than usual. Plumbing – will you need to have new pipe work installed before work on the room goes ahead? Will this involve lifting up floorboards and removing walls or plasterboard? Will you need new radiators as well as a standard hot and cold water supply? Waste water also needs to run downhill – so will this affect your exterior pipe-work and guttering? Space – do you have the room for an en-suite to begin with? Most bedrooms should be at least three metres squared if you’re thinking of having an en-suite fitted into the existing space, but this could be a bit less if you’re thinking of knocking into an adjacent room or cupboard. Some home-owners are also happy to have a shower-only en-suite, or just a single toilet – they can often be tailored to whichever you’d prefer. A standard en-suite bathroom will be somewhere between one to two metres squared, and half of that space will be taken up by the shower tray – so make sure an architect or contractor plans how things are going to fit together before you sign on the dotted line. Lighting – many en-suite bathrooms, upstairs or downstairs, are built in the centre of a property, and as such don’t always have access to natural light. Of course if it is adjacent to an existing wall on the property you can always have a window installed as part of the refurbishment, but if not there are plenty of other option to consider – from regular halogen lighting to internal, colour-changing spotlights with additional mood enhancers! Ventilation – you will also need to make sure that enough fresh air is ventilated throughout the en-suite to prevent the build-up of damp, mould and mildew residue. If you have a window leaving this open regularly will obviously help to reduce moisture levels, but otherwise you might need to have an internal fan installed somewhere in the bathroom. For further information about ventilation guidelines you should read up on the Part F of the British Building Regulations. Style – en-suite bathrooms are usually very small, so style and design is important to make you feel comfortable using the extra space. Warm, calming colours often work best in such an enclosed space, while sliding doors and a frame-less shower door help to keep things neat and organized. If you don’t like feeling too claustrophobic and cramped, installing mirrors and glossy, white tiles in the en-suite will also help maximize the illusion of more space. Storage – finally, think about whether or not storage is going to be a major aspect of your new en-suite bathroom. If you’re taking up a large proportion of the old bedroom, then you may need to think about extra cupboards and shelves to house all your bathroom accessories – otherwise there’s no reason why they can’t stay in the bedroom on a dresser or bathroom specific-shelf, ready for whenever you need them! When planning your ensuite bathroom, always hire someone to visit you home to inspect the space and layout, as remotely it is not possible to understand if it is possible to build it in the desired location. Also, avoid committing to buying any item on sale, as they might not be suitable for your intended layout. Always, discuss first with the professionals you will hire and then buy any bath supplies. How much will an en suite bathroom cost? The average cost of adding a new bathroom to a house is around £3,000. However, the cost of an en-suite bathroom can easily reach up to £4,000, depending on your specifications, materials and location in the house. It is recommended to build the new bathroom i) next to the existing one ii) bellow iii) or above, as this way it is not necessary to avoid redirecting plumbing such as soil and waste pipes. You need to estimate how many hours of plumbing work will be required and have enough budget. It is easier to estimate the cost of fixtures and fittings once all the plumbing work has been completed. A basic electric shower costs as little as £50, but for more stylish and functional unites expect to pay between £100 and £200. Power showers prices start from £200. Digital showers, shower towers, shower columns and shower cabins start from £500 and can cost as much as £2000, depending on the model that you wish to go for. Investing in shower enclosure always pays off because it is used everyday and improves the look of the bathroom. Shower cubicles prices range from £150 – £600. Wet room enclosures cost from £500 upwards. The cost of a wet room in proportional to the structural work required (plumbing, waterproofing, shower and screen). The cost of a wet room shower depends on the fixtures, fittings and tiling work required. Ceramic basins cost from £50 upwards. Vanity basin unit prices start from £80 but expect to pay £200 – £350 on average, as usually they come separate. For a basic type of toiler expect to pay about £50. For a good quality toilet expect to pay between £150 and £300. Tip: You can save money by buying together with a matching basin as a bundle. Bathroom taps are as important as other bathroom fixtures. Choose wisely as it can be an important addition and can me your basin look high end. Expect to pay from £20 to £100 for a good mixer and £400 for high-end one. For more accurate price projections based on your specific circumstances, you should get in touch with as many different contractors as possible, and see if any will carry out a free, preliminary inspection of your property to come up with the most detailed quote available. Loft Conversion Cost – How much does a loft conversion cost?